I love hearing stories about people who get innovative when they can’t find a product on the market that fits their needs. 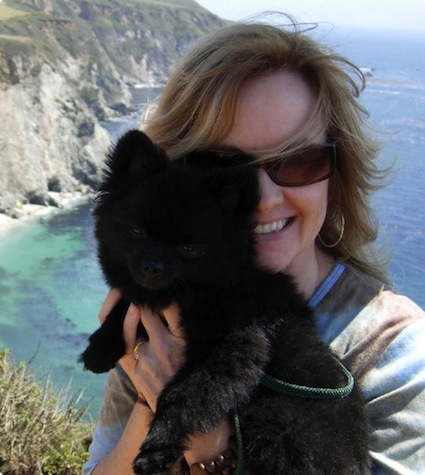 Cynthia and Tom Darmstandler’s pomeranian, Kona, became ill after eating chicken jerky made in China. After Kona’s recovery, Cynthia went to her local pet store to try to find chicken jerky made in the USA, and couldn’t. She and her husband launched Kona’s Chips, and began making their own dog & cat treats using human-grade food produced in the USA, and obtained Made in the USA certification. Kona’s Chips sent some treats along for Argo & Stella. When it comes to dogs and treats that are 100% chicken breast and nothing more, you really can’t go wrong. And it feels good to feed my dogs food that looks like something I might eat on a backpacking trip. 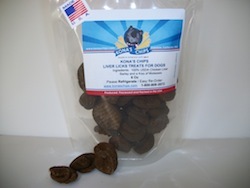 Kona’s Liver Licks are made from chicken livers, barley, and molasses, and look equally edible – like little cookies – although the smell is way more appealing to Argo & Stella than it is to me. But there’s something to be said for the influence of stinky dog treats on dog behavior. If a dog treat is fragrant, my dogs pay careful attention to everything I say to them! If you order treats from Kona’s Chips, please note that since they don’t contain preservatives, they need to be refrigerated or frozen upon arrival. 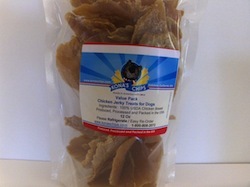 Kona’s Chips also makes an effort to support some great pet and people causes. Through Kona Kares, Kona’s Chips donates to Fluffy Butts Rescue Resort, a dog rescue group for puppy mill and abandoned dogs, Cpl. Sean A. Stokes Legacy Project, which supports Working Military Dogs, and Canine Support Teams, Inc., an organization that facilitates an inmate staffed service dog training program.